There are a variety of reasons why you may have a dry cough during pregnancy such as a virus, allergies or throat irritants. It is important to know the cause of your dry cough so you can get some relief with appropriate treatment. When you are dealing with a dry cough, your treatment will depend on what is actually causing the dry cough. This will need to be discussed with your doctor. Therefore, you should wait until your doctor advises you on how to treat your dry cough before taking any over-the-counter medications or even trying any home remedies to treat the cough yourself. Hard candy or natural cough drops can be soothing to the throat. Staying hydrated is important. Becoming dehydrated could worsen your symptoms and affect your immune system. Drinking warm water with honey or lemon can soothe your throat and help alleviate the coughing. Drinking tea such as chamomile or ginger with honey may help calm your dry cough. Chicken soup or any soup is nutritious and will help relieve your sore throat and quiet the coughing. Eating raw garlic with your food can be helpful in alleviating the dry cough. Only take cough syrups (suppressant or expectorant), anesthetic sore throat lozenges, and cough drops if approved by your doctor. Staying upright after eating can help with potential acid reflux which in turn can cause a cough. Gargling with warm salt water is a very effective way to treat a dry cough. Keeping your head elevated. The coughing will most likely become worse if you lie flat. Staying away from potential irritants and known allergens that may trigger your dry cough. Staying away from anyone who has a virus. Using a humidifier in your room may help if you have any congestion with the cough. Getting your rest. Taking naps, if necessary, and getting a good night's sleep. A dry cough can be irritating, no matter what stage of pregnancy. Be sure to communicate with your doctor. That is the best way to ensure that you are getting the right treatment for your symptoms. A dry cough is a non-productive cough, which means it does not produce any mucus or phlegm. For the most part, it is an irritating, tickling sensation in the throat. A dry cough may occur when there are unwanted irritants or microbes in the breathing passages. The cough is a reaction to help clear out the breathing passages. Women may experience a dry cough during any stage of pregnancy, but some women complain about the problem increasing during the last stages of pregnancy, as breathing becomes more difficult. It is important to know what causes a dry cough during pregnancy and how can it be treated. A dry cough may be caused by the common cold or viral infection. The virus is an irritant that causes coughing and usually becomes worse at night. 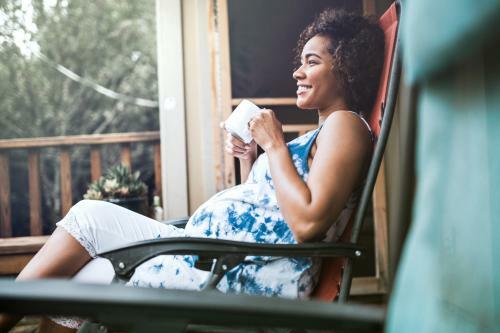 Many pregnant women experience cold symptoms during pregnancy, which can lead to both productive and unproductive coughs. Allergies can cause a dry cough due to the irritants and allergens in the air that can affect your breathing passages. Asthma sufferers can experience unproductive coughs and breathing difficulties. Bronchospasm is over-activity in the muscles of the bronchioles, which can occur during an allergic reaction to food or an insect bite. This can also occur if you have chronic bronchitis, asthma, or anaphylaxis (hypersensitivity to foreign proteins or other substances). Rhinitis of pregnancy is a condition where elevated estrogen levels cause inflammation of the mucus membranes inside the nose which can lead to a dry cough. A weakened immune system can make you susceptible to virus' and infections which can lead to a dry cough. Acid reflux and heartburn can contribute to a dry cough as well. Insomnia or disrupted sleep patterns may happen when the coughing episodes occur at night and affect your sleep which can in turn affect your overall health. Urinary incontinence is not unusual during pregnancy but it can become severe with a dry cough. Suppressed immune system due to a dry cough could increase the risk of infection that could lead to various health problems. Reduced appetite is associated with a dry cough which could lead to nutritional deficiencies. A dry cough can also cause physical, emotional, and mental stress. Is There Any Connection to Whooping Cough? Whooping cough is a highly contagious respiratory bacterial infection. The cough associated with the whooping cough is an uncontrollable, hacking with a high pitched "whoop" sound. A runny nose, congestion and sneezing also accompany the whooping cough. Therefore, there is no connection between a dry cough and whooping cough. Whooping cough is very dangerous to babies, and that is why it is important for pregnant women to get the whooping cough vaccine in the third trimester of each pregnancy. This will ensure that once your baby is born, he is protected until he receives his next whooping cough vaccine at two months old. Could a Dry Cough Hurt the Baby? The baby is well-protected by the placenta which serves as a barrier for the baby; therefore, coughing of any kind will not hurt or affect your baby in any way. However, it is important that you do not ignore your symptoms because if there's an infection associated with the dry cough, it could spread internally and possibly affect the baby. So be sure to get checked by your doctor at the very onset of your symptoms. It is important that you be proactive and consult with your doctor when coughing symptoms first arise. Staying healthy is imperative for the well-being of you and your baby.